Vijay Sethupathi has got back to the rural routes after a long time with Karuppan, which released today for pooja holidays. Kathir (Bobby Simha) has an interest for Anbu (Tanya Ravichandran), but due to family situations, she gets hitched to Karuppan (Vijay Sethupathi). What does Kathir do, to separate Karuppan and Anbu, and does he finally get to marry Anbu? is what the basic premise of the film is about. Vijay Sethupathi proves again he is an effortless performer, who easily fits in any given role. Karuppan character looks tailor-made for Makkal Selvan, who makes no mistake in delivering it. His charismatic screen presence and body language are enjoyable. Unlike other mainstream commercial films, Karuppan's heroine has a meaty role with good screen time, fortunately. Tanya has an expressive face, and she has done justice to her role. However, it would've been better if Tanya had rendered her own voice, instead of opting for a dubbing artist. Bobby Simha's role as the antagonist could have been designed with more weightage and scope for performance. Other actors like Pasupathi, Renu emote well with the limited scope given to them. Singam Puli's comedy has majorly worked. The first half of the movie is full of celebration and happy moments. Only in the latter half, the film takes the serious route with vengeance, drama, and much more. 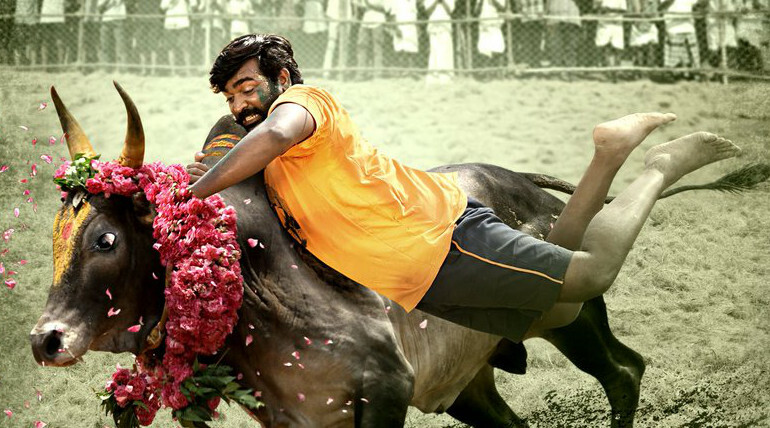 Karuppan has a done and dusted screenplay, that we've seen in many films earlier, but the saving grace here is, Vijay Sethupathi's performance. If not for Vijay Sethupathi, this film wouldn't have got this flavour and engagement. His chemistry with Tanya is pretty decent, and their scenes together work well. The Jallikattu scene needs a special mention, as it has been shot so colourfully, with full of energy. The sentiments are overdone to an extent, and after a certain point of time, it turns too melodramatic. One complainable issue in the film would be the vengeance portions, which doesn't engage you much. The need or importance of Sharath Lohitashwa's character is questionable. Though he is being showcased as a notorious villain, he neither has a significance nor travels till the climax. The song sequences could've been chopped off, especially the Murukku Meesa Mama number. On the technical front, Shakthivel's visuals capture the scenic beauty of the rural areas. D.Imman's background score is better than the songs, which don't stay in you. Panneerselvam, who made his debut through the critically acclaimed Renigunta, has taken the commercial route for Karuppan. Taking up the rural backdrop as the base, he could've given an engaging, colourful drama, instead of opting for a vengeance drama that we've already witnessed many times. Verdict: A watchable village revenge drama, for Vijay Sethupathi's performance!